MYSURU: For Congress strongman and former chief minister Siddaramaiah, it’s a high-stakes battle in Mysore-Kodagu, the constituency where saffron is slowly seeping through. After driving a hard bargain with ally JD(S), he managed to keep Mysore for the Congress and fielded fellow Kuruba and former MP C H Vijayashankar against sitting BJP MP Pratap Simha. A win here will allow Siddaramaiah to regain lost ground, and remain undisputed leader of his home turf. As his shadow-boxing with the BJP continues, the picture that emerges is one of many challenges for the Congress. The BJP got a head start with its campaign, playing the Modi card and trumpeting Simha’s performance. Congress and JD(S) leaders took their time to hammer out a seat-sharing matrix, and when the candidate was finally announced, it was time to play catch-up. Coalition leaders did come together to campaign, but with time running out, it was too little, too late. With JD(S) leader G T Devegowda and Siddaramaiah agreeing to keep their acrimony aside for the greater cause, a positive message has gone out to voters that all is well with the coalition. It was an ironical sight as the friends-turned-foes campaigned together -- certainly not easy for Siddaramaiah after their Chamundeshwari assembly encounter in 2018 left him nursing a battered ego and reputation. Now, he is trying his best to break the ice with the dominant Vokkaligas here, knowing that one more defeat for the Congress would throw a shadow over his leadership and dominance in Old Mysuru region. The high command had, despite the Congress losing the assembly elections, backed Siddaramaiah and made him Congress Legislative Party leader and also gave him a free hand with the cabinet expansion. But a loss in Mysore-Kodagu could translate to a loss in faith. The leader, who has a strong Ahinda vote backing, realises that he will need to exercise diplomacy and flexibility to get into the good books of Deve Gowda, and ensure the transfer of the sizeable JD(S)’ Vokkaliga votes. He has also brought in his confidant, former minister H C Mahadevappa, to lead from the front to organise Ahinda votes and coordinate with JD(S) to regain the Congress foothold in the constituency. The guru-shishya team of Gowda and Siddaramaiah also realises that a loss here will spell doom for the coalition government in Karnataka, and put their leadership status at stake. In Kodagu, a traditional BJP stronghold, the Congress leadership is trying to chant the unity mantra, and Vijayashankar, who also served as BJP MP, MLA and minister, is reaching out to disgruntled BJP leaders and those unhappy with Prathap Simha. The BSP, which has fielded B Chandra, could dent the Ahinda vote of the Congress. BJP candidate Pratap Simha, who started his aggressive campaign three months ahead of his rivals, took advantage of the confusion in the alliance camp and delay in finalising a candidate. The BJP holds four of the eight assembly segments, JD(S) holds three and Congress one. Simha is confident that coalition workers have failed to reach the grass roots, and expects a huge chunk of Vokkaliga votes to move to the BJP. Simha, like most BJP candidates, is banking on the Modi wave, and has also marketed Central government funding for the 10-lane Benglauru-Mysuru expressway, completion of railway double track and electrification, the Mysuru-Kushalnagar railway line and other projects. 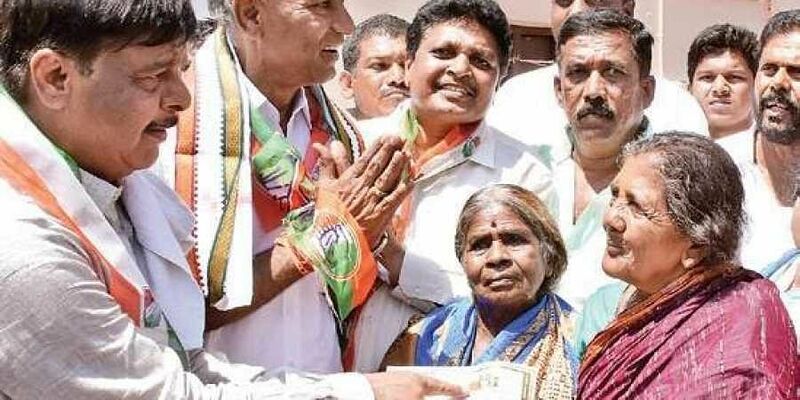 The BJP’s Dalit outreach includes fielding Dalit leader V Srinivasa Prasad in neighbouring Chamarajanagar to win over backward and microscopic communities. It also hopes to draw mileage from the fact that a few local JD(S) workers have supported the BJP and raised pro-Modi slogans. Modi, nationalism and clean governance are key to the saffron campaign, said state BJP spokesperson G Madhusudhan, predicting a BJP win margin of 1 lakh votes. The party, which has a strong hold in Krishnaraja, Chamaraja and Kodagu districts, has made inroads into rural pockets. Moving a bill in Parliament to include Pariwara–Talawara communities into the Scheduled Tribe list won over the dominant Nayaka community. Besides, first-time voters and youngsters will also give the BJP a fillip. However, a few leaders and workers unhappy with Prathap Simha have not put their soul into the campaign and accuse him of not respecting dedicated workers and senior leaders.